Beautiful, 300 years old, country villa with large lands for total privacy, multiple terraces and a separate guesthouse with own kitchen. 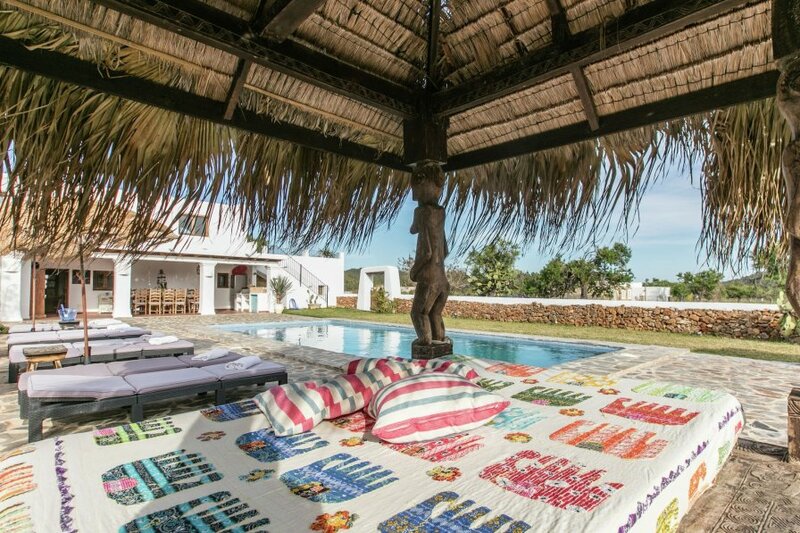 The villa is situated on the north part of Ibiza, close to the village of San Carlos. The many beaches on the northeast are close by, a short 10 minutes’ drive. It is a great place to enjoy the Ibiza summers with friends or family. Built 300 years ago but the villa has all the modern commodities. Step into the villa and you come into the lounge / living room with high ceilings, where you have 2 sofas, TV and chimney. On the same floor you have a separate dining room with large dining table and direct access to the outside dining area and pool. The kitchen is large with all modern appliances. The villa has 7 bedrooms and 6 bathrooms located into three parts. All bedrooms are double rooms, have air con, wardrobe and windows. Bedroom 1 is located on the ground floor next to the living room and bedroom 2 on top of it, both has their own bathroom. Bedroom 3,4 and 5 are located on the first floor. Here you also have a second living room with 2 large sofas, TV and terraces with access to the pool area. Bedroom 3 has its own bathrooms where of room 4 and 5 shares a bathroom, located just in between the rooms. Bedroom 6 and 7 are in a separate guesthouse just next to the main villa and has its own entrance. Here you have an open plan kitchen with dining table and living room with 2 sofas and TV. Each bedroom has its own bathroom. There are 2 terraces here and a garden perfect for children to play in or to practise yoga. The villa has an outdoor kitchen with large BBQ space, overlooking the private pool area. A wooden table for 14 guests make this area ideal place for meals during the warm summer months.